Among all types of cancer, skin cancer is the leading form of cancer diagnosed in patients in the United States. In fact, there are more new cases of skin cancer every year than breast cancer, prostate cancer, lung cancer, and colon cancer combined. According to the Skin Cancer Foundation, approximately 1 in 5 people will suffer from some form of skin cancer during their lifetime. With such high prevalence of skin cancer, it is important for individuals to monitor their moles for any changes in appearance and to seek medical help if anything suspicious arises during self-screening. It is also essential for dermatologists and other medical professionals to thoroughly examine patients for skin irregularities that may signal an underlying condition. When skin cancer is detected early, it can be entirely cured through immediate treatment, which may involve surgery, radiation, or chemotherapy. However, when doctors fail to diagnose skin cancer, are delayed in diagnosing the disease, misinterpret biopsy results, or make errors in treatment, skin cancer can progress and spread elsewhere in the body, placing the patient’s life in jeopardy. When medical negligence occurs in the course of skin cancer diagnosis or treatment, patients and their loved ones can pursue justice through medical malpractice or wrongful death litigation. At Fronzuto Law Group, our New Jersey medical malpractice attorneys regularly advocate for victims of cancer misdiagnosis and other forms of medical negligence across the state. With a firm that concentrates on medical malpractice, we are extremely well-versed in the legal and medical nuances of these cases, and we employ all of the knowledge and resources at our disposal to obtain maximum compensation for our clients. If you or someone you love suffered harm as a result of skin cancer misdiagnosis or failure to diagnose skin cancer in New Jersey, our medical malpractice team can help. Our commitment is to provide unparalleled representation and client service, and we purposely limit our caseload to accomplish that for every single client. To discuss the circumstances of your case and learn about your potential legal options, schedule your free initial consultation today by calling 973-435-4551 or contact us online. Skin cancer develops when there is damage to the DNA of skin cells, causing genetic mutations. These abnormal cells then rapidly multiply, forming a malignant tumor. The primary source of DNA damage is ultraviolet light, which can be produced naturally by the sun or artificially through tanning beds. Skin cancers are delineated into several distinct categories. First, skin cancer can manifest as melanoma or non-melanoma. Melanoma skin cancer occurs in the skin cells that produce pigment, known as melanocytes. Melanoma is the least common form of skin cancer; however, it is also the most life-threatening type. 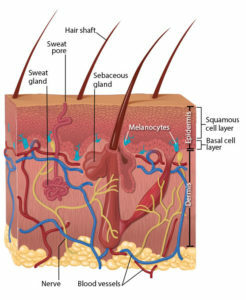 As for non-melanoma skin cancers, these begin in the actual skin cells. The two major types of non-melanoma skin cancer are basal cell carcinoma, which occurs in the majority of cases, and squamous cell carcinoma. Skin cancer can cause serious damage if it is not detected in early stages, by migrating to other areas in the body, particularly the lymph nodes, or causing localized disfigurement in the affected area. In the most devastating cases, skin cancer can invade other areas of the body, progressing past the point at which the patient’s life can be saved. As mentioned previously, skin cancer is very responsive to treatment if it is identified in the early stages. If doctors diagnose skin cancer, they may excise or surgically remove the mole or growth where the cancer is localized. Treatment may also include radiation therapy or chemotherapy. In order to diagnose skin cancer, medical professionals must conduct a comprehensive physical exam to identify skin abnormalities. Skin biopsies may then be used to detect abnormal tissue. Doctors may also examine lymph nodes to assess whether or not the cancer has likely spread to the lymph system. If a physician suspects that the cancer has invaded other areas of the body, he or he may also order imaging tests such as CT scans or MRI’s to determine if the cancer has migrated. Failure to diagnose skin cancer and skin cancer misdiagnosis may occur when doctors fail to take a thorough family history, fail to recommend early screening for patients at increased risk for skin cancer, fail to refer patients to a dermatologist or other specialist, fail to order biopsies or other tests, misread biopsy or test results, or fail to follow-up on these results. Errors may also occur during skin cancer treatment, specifically, during excision procedures, surgical removal of malignancies, radiation therapy, or chemotherapy. If a medical professional was delayed in diagnosing, failed to diagnose, or misdiagnosed skin cancer in you or someone you love, you may have grounds to file a claim. Contact the New Jersey medical malpractice attorneys at Fronzuto Law Group at 973-435-4551 for additional information. Our contingency model means you do not pay a dime until we successfully obtain your recovery.